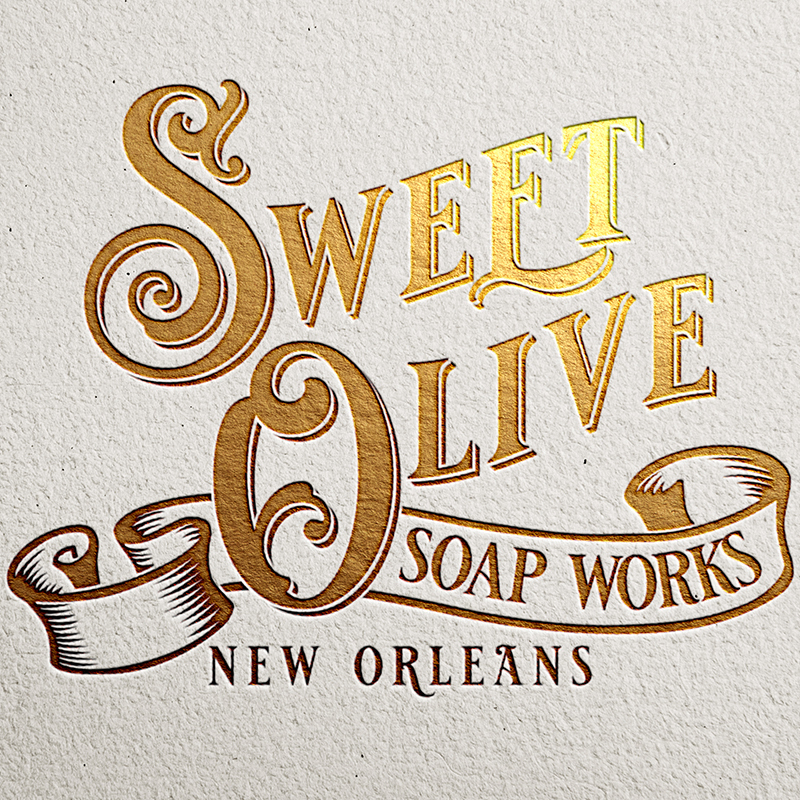 Blended with luxurious oils, Sweet Olive Soap Works brings you the best of Louisiana-grown and skin-loving ingredients for gourmet soaps, dead sea salts, and body butter products. Every batch of olive oil based soap is handmade using the cold process method and then cured for one month because quality takes time to reach perfection. 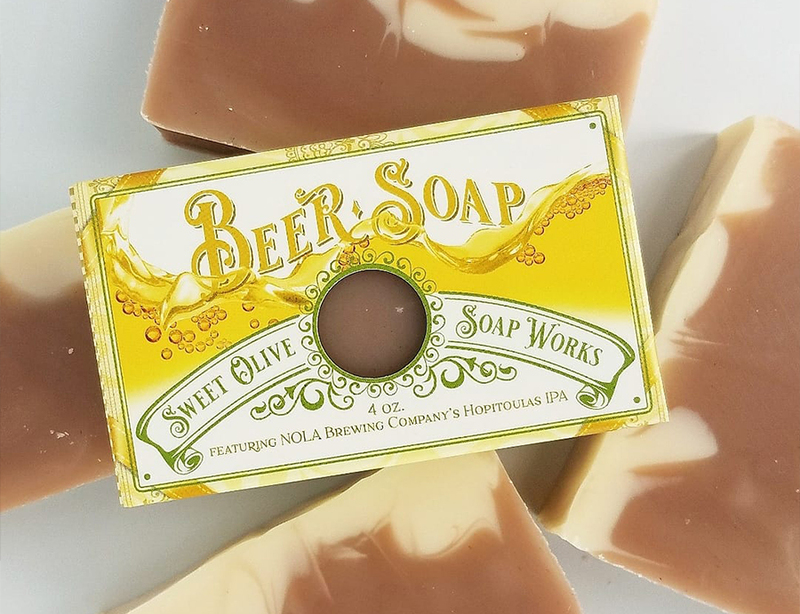 Soap maker Emily Manger handcrafts each bar of soap using the traditional cold process method passed down through generations of her Louisiana ancestors. 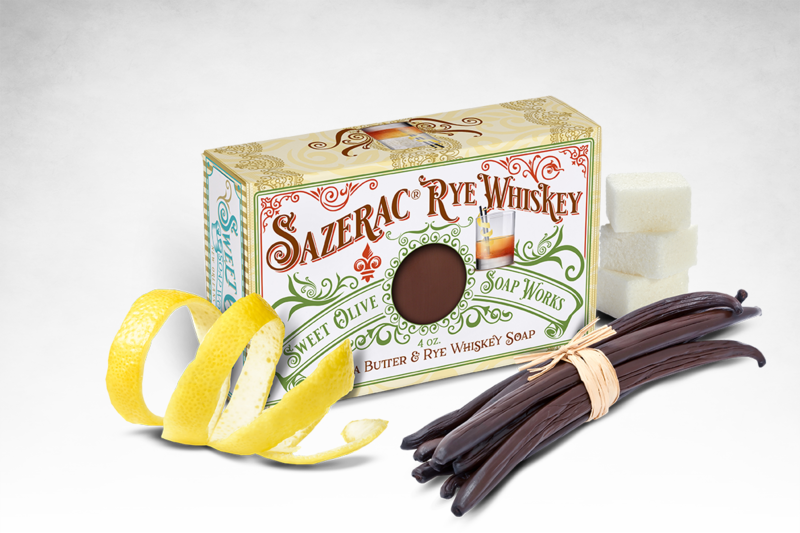 By creating soap the old fashioned way, this southern soapery produces each batch from scratch using gourmet recipes that have been formulated to naturally nourish and moisture your skin. 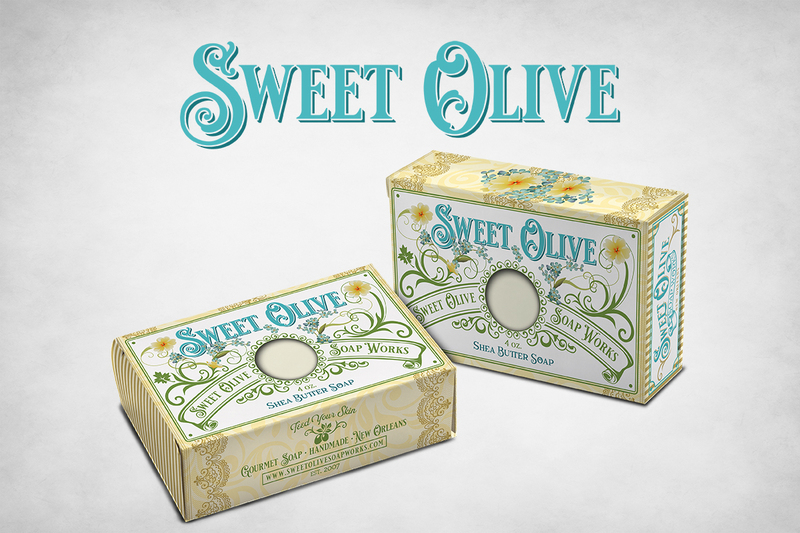 Sweet Olive Soap Works recently celebrated its eleventh anniversary in business. After ten years, the soapmaker decided to update the company logo and rebrand the products by collaborating with Midnight Boheme to create new designs. Midnight Boheme was more than honored to work with Sweet Olive in refreshing an already well-established brand by giving it a "digital facelift" and stylizing the new logo similar to the original but with new panache! 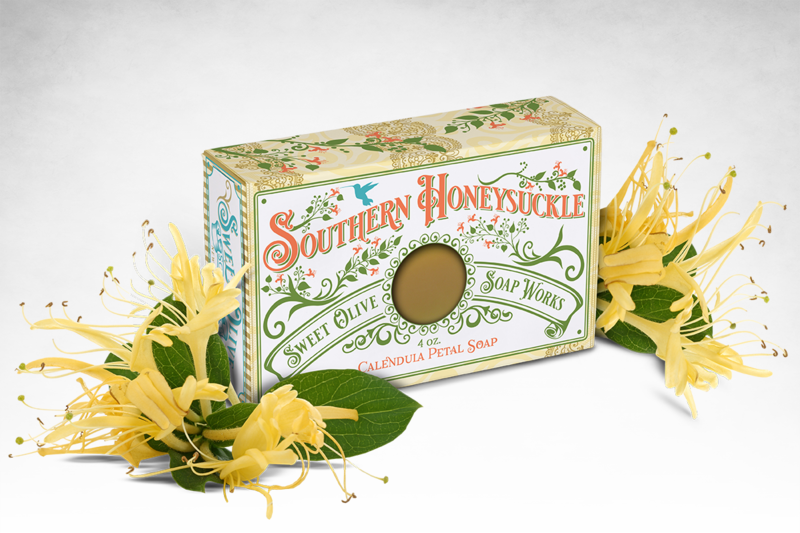 Inspiration was abundant in supply as Midnight Boheme began rebranding Sweet Olive Soap Works as the soap company's existing brand had a youthful, bright, handcrafted ambiance and just needed to take it to the next level of a more boutique-style, gourmet southern soapery shop. Stacking the soaps along her desk, designer Laura Kuhn inhaled each scent as she designed the new brand and packaging to ensure an authentic source of muse for the visual artwork. 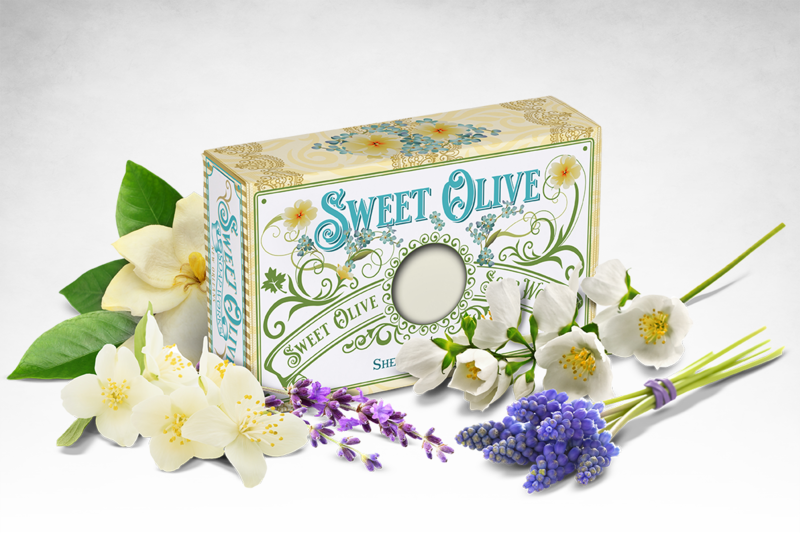 Launching the new brand in 2018, Sweet Olive promotes on Facebook and Instagram along with e-blasts to customers past and potential to announce special sales and discounts on merchandise. The response has been extremely positive to the new brand and the updated packaging with the fresh gourmet recipes for soaps, bath sea salts, and body butter. 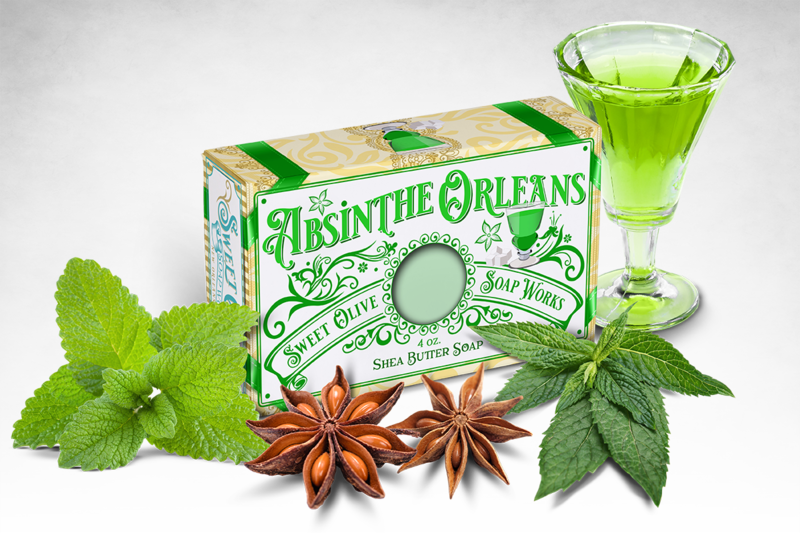 Keeping in the French spirit of the city, Absinthe Orleans offers the sharp blend of anise, peppermint and lemon balm essential oils for an invigorating lather popular among artistic bohemians and New Orleanians alike. 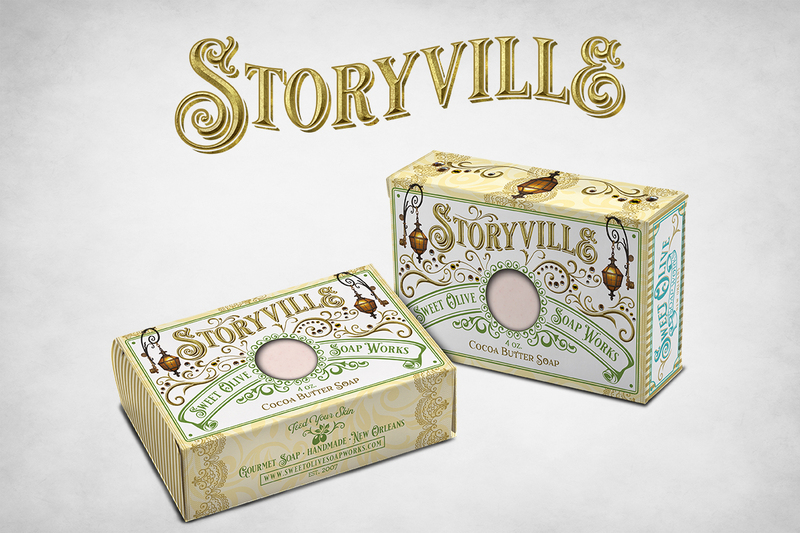 Packaging design by Midnight Boheme, inspired by the soap's gourmet ingredients of anise, peppermint and lemon balm. 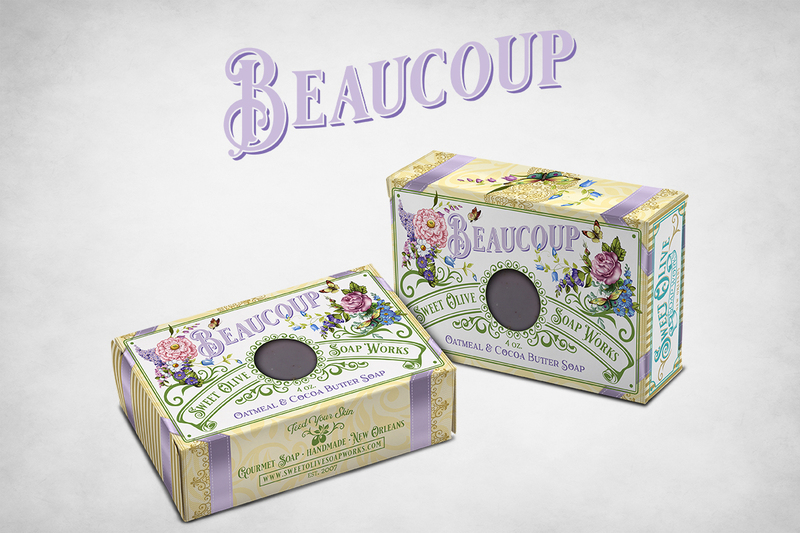 With a bubbly and moisturizing lather scented with a sassy, yet classy fragrance blend of lavender and eucalyptus, Beaucoup Soap is blended with skin pampering cocoa butter, goat milk, honey, oatmeal, and finished off with lavender buds. 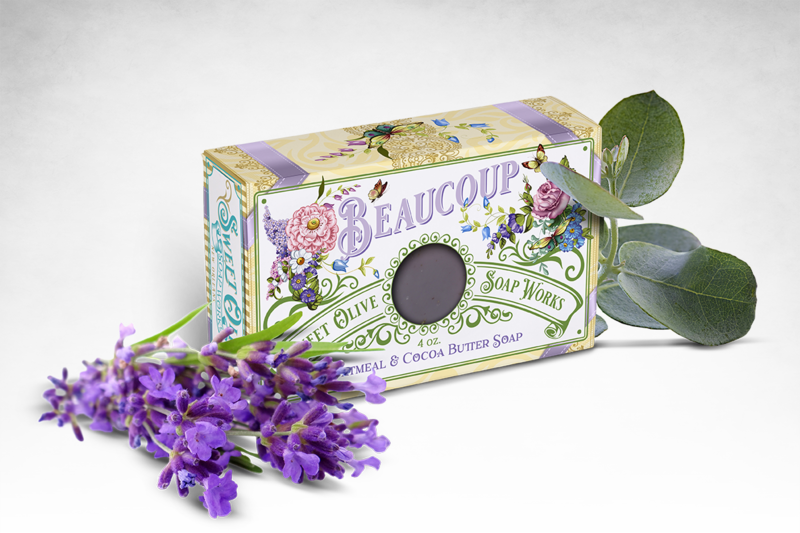 Packaging design by Midnight Boheme, inspired by the soap's gourmet ingredients of lavender and eucalyptus. 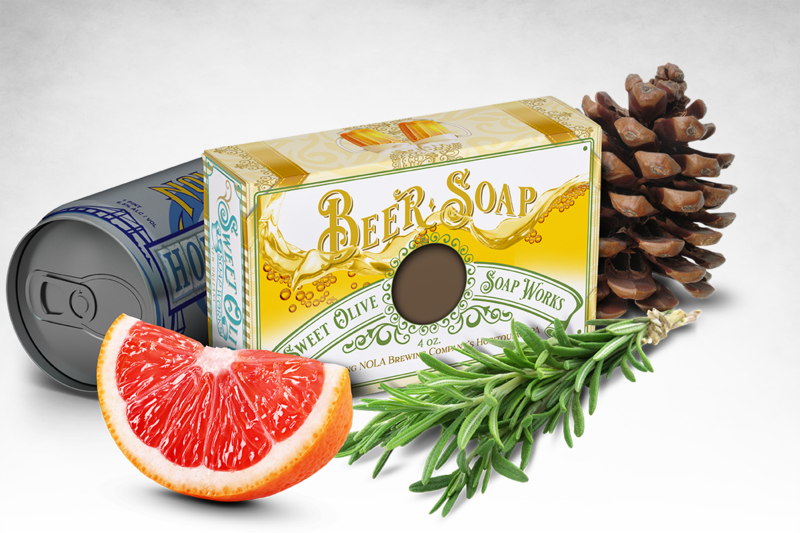 NOLA Brewing Co.’s Hopitoulas India Pale Ale blended with moisturizing vegetable oils makes a bubbly and nutrient rich soap that is scented with an upbeat blend of pine, pink grapefruit and a hint of rosemary. 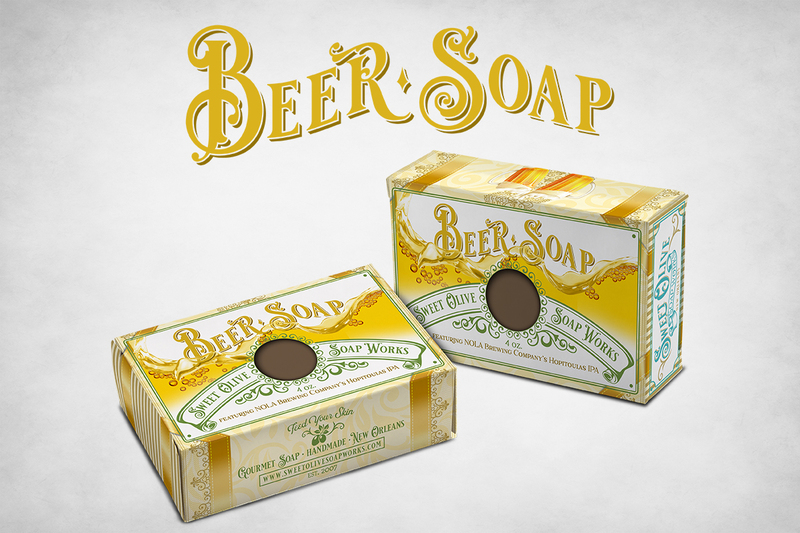 Packaging design by Midnight Boheme, inspired by the soap's gourmet ingredients of vegetable oils and beer. 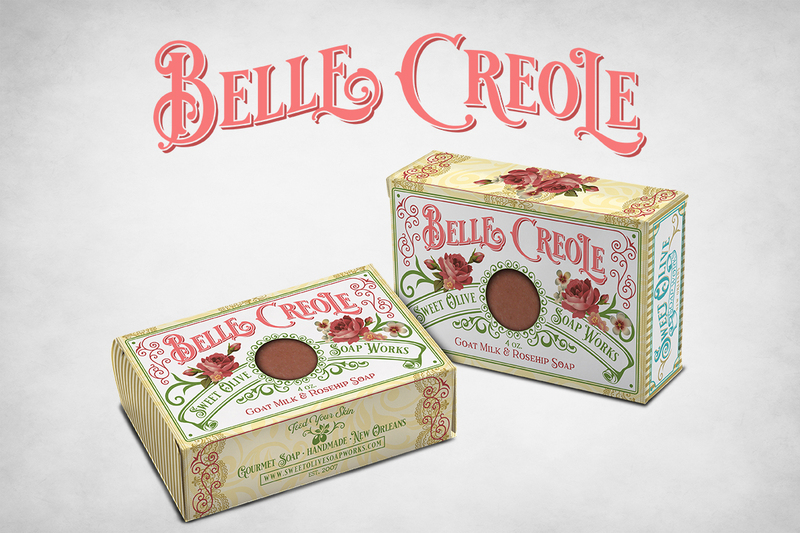 Gentle and moisturizing, Belle Creole blends skin softening oils with nutrient rich goat milk, rose hips, rose water, and rose clay, scented with a captivating essential oil blend of roses, jasmine and sandalwood. 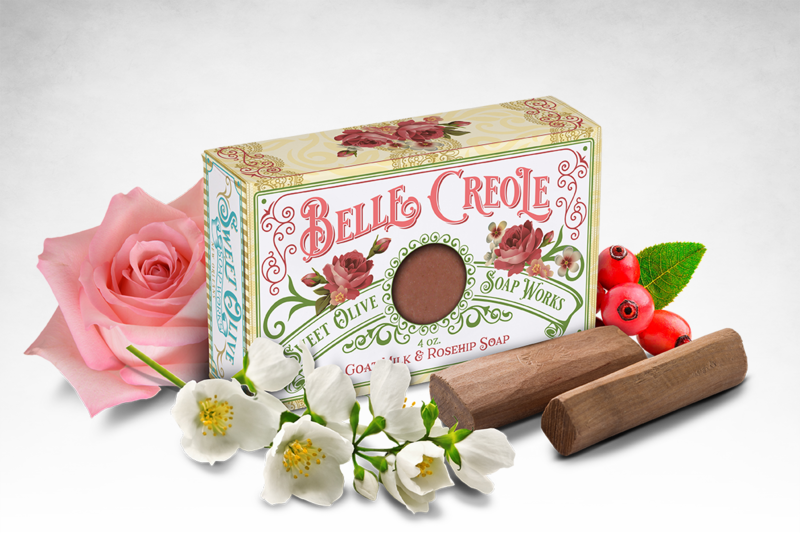 Packaging design by Midnight Boheme, inspired by the soap's gourmet ingredients of roses, rose hips, rose water and rose clay. 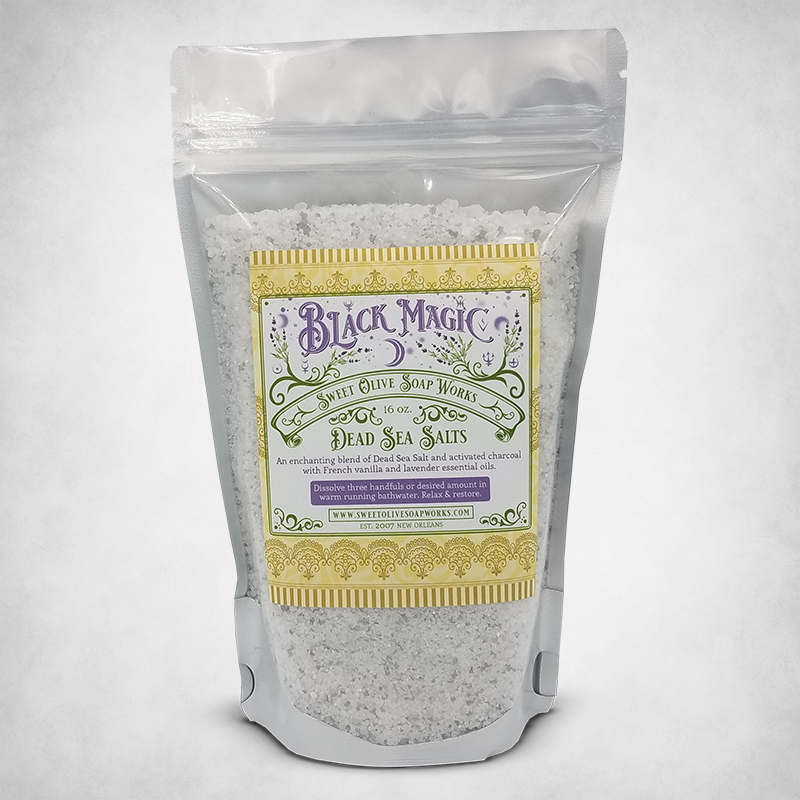 A bewitching bar of soap, Black Magic is an all-natural detox soap infused with the enchanted fragrance blend of French vanilla and lavender essential oils that promote tranquility and relieve stress by soothing mind, body and spirit. 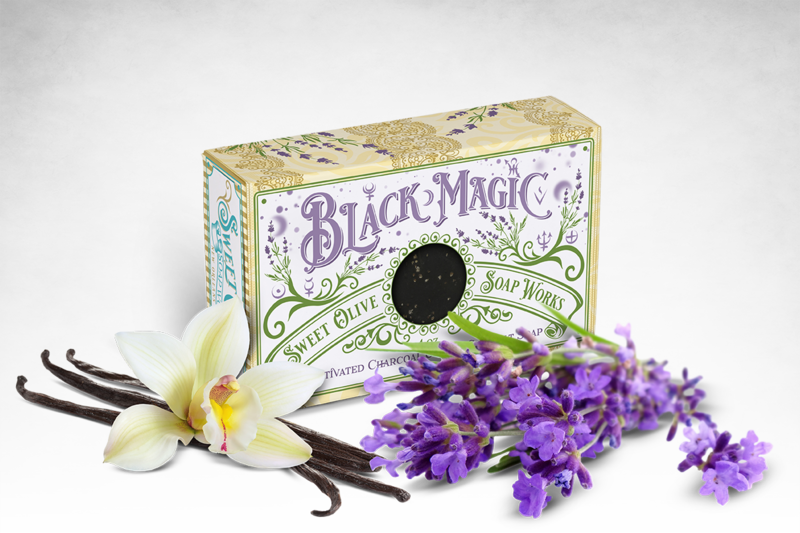 Packaging design by Midnight Boheme, inspired by the soap's gourmet ingredient of lavender with a pinch of magic. 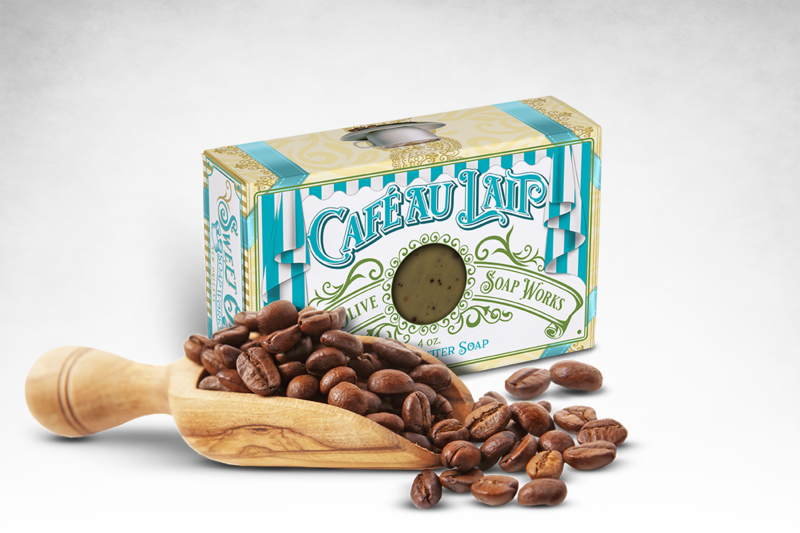 Wake up with the aroma of New Orleans French roast and chicory coffee topped with dollop of milk for your skin! 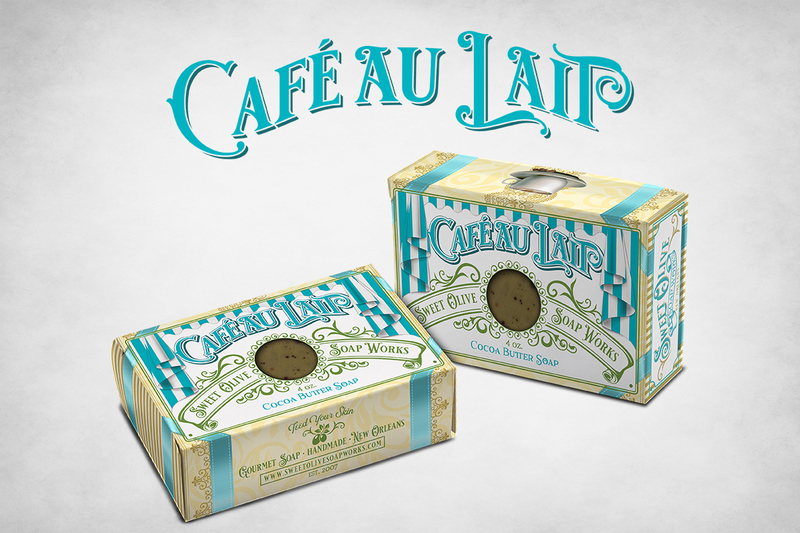 Café Au Lait is two gourmet soaps fused into one for an exceptional clean indulgent moisture. 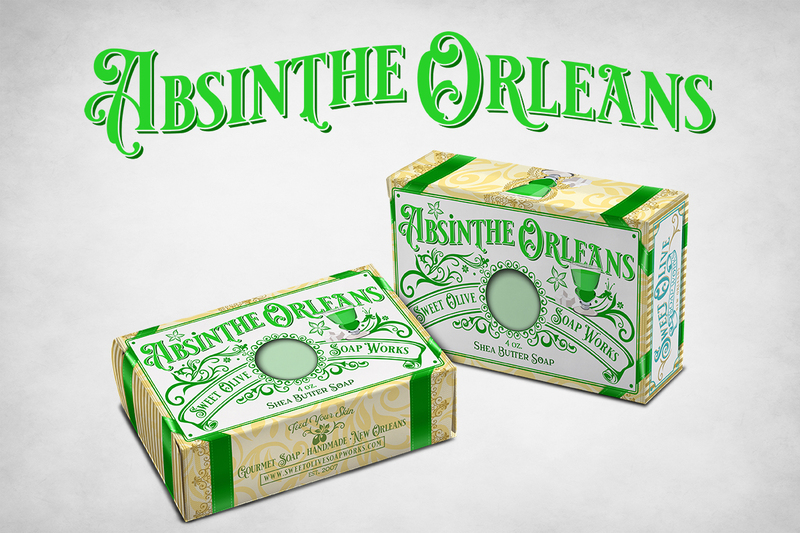 Packaging design by Midnight Boheme, inspired by the soap's namesake for coffee beans and milk. 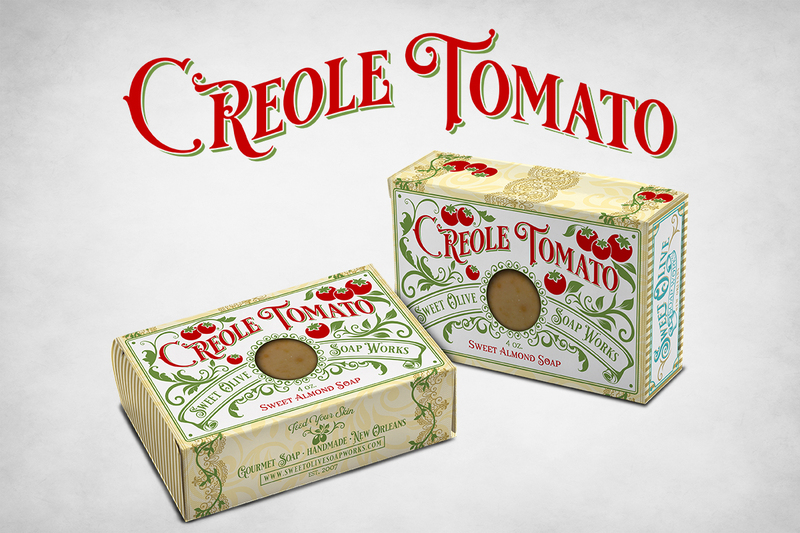 An exciting lather of Creole Tomatoes that have been picked at the height of ripeness to maximize their amazing powers and scented with a garden-fresh tomato leaf fragrance. 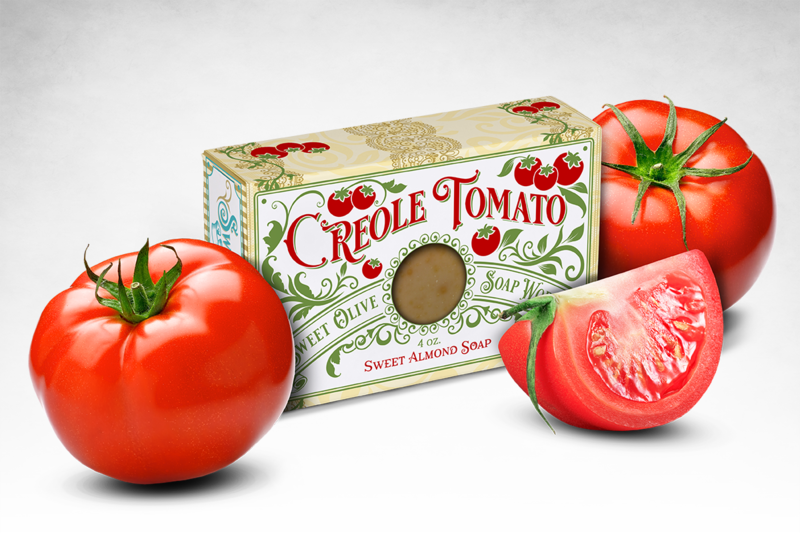 Packaging design by Midnight Boheme, inspired by the soap's gourmet ingredients of Creole tomatoes and tomato leaves. 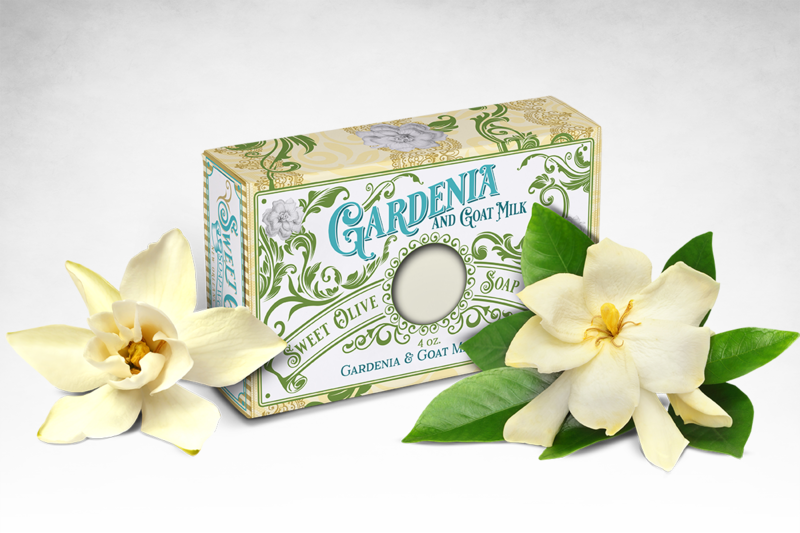 Gardenia & Goat Milk Soap is blended with farm fresh goat milk and a rich, sweet almond combination of skin nourishing oils that works up a creamy and moisturizing lather than your skin and senses will savor. 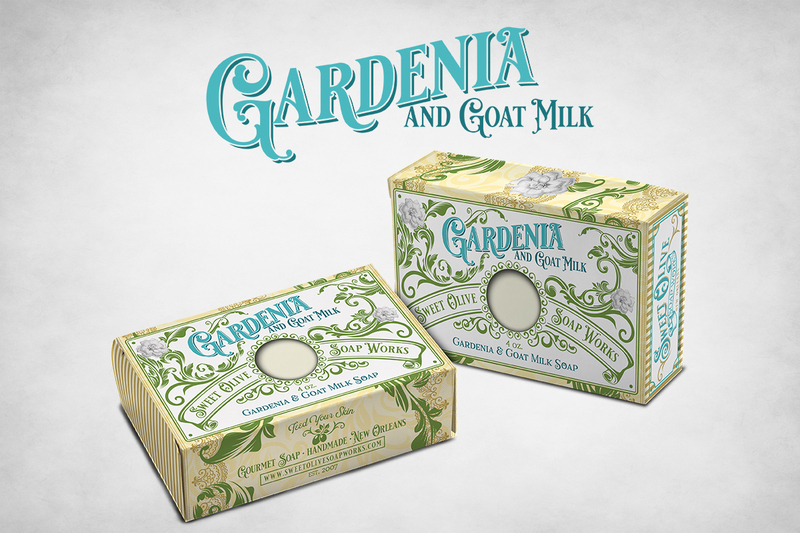 Packaging design by Midnight Boheme, inspired by the soap's gourmet ingredients of gardenias and goats milk. 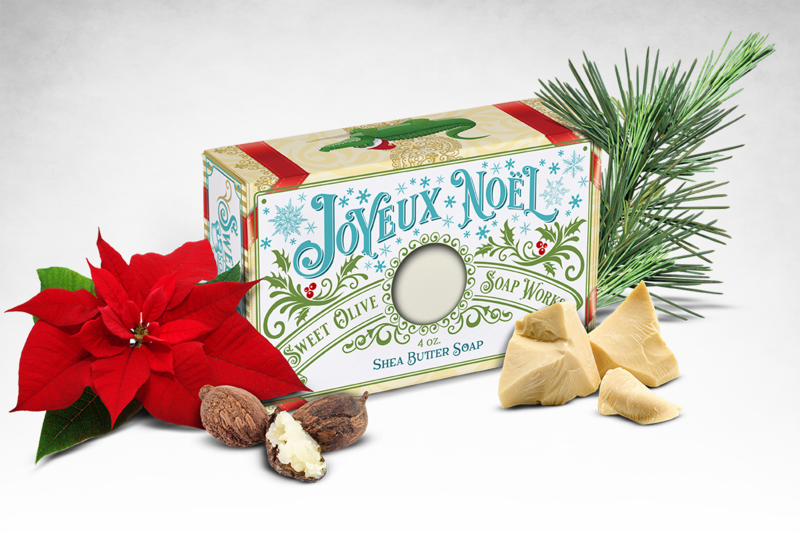 The Joyeux Noël Shea Butter Soap is a holiday-themed fragrance blend of blue spruce and balsam fir which will remind you of a winter stroll through the pine forests of Louisiana. 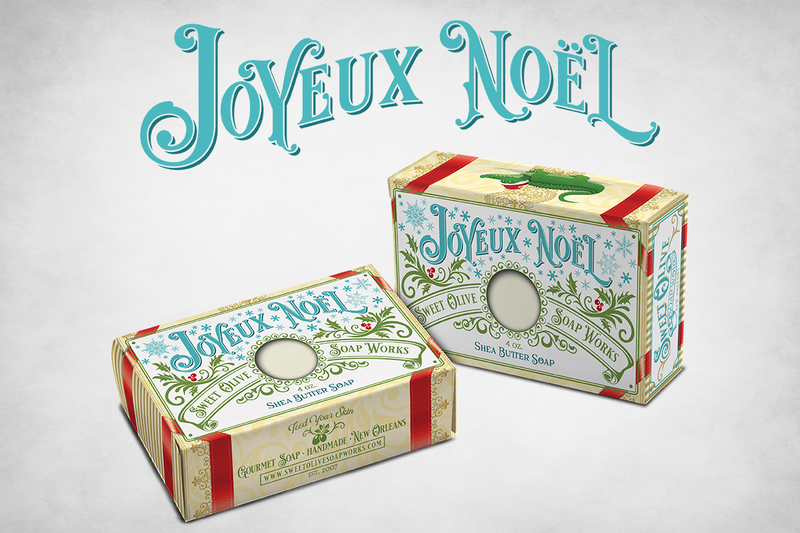 Packaging design by Midnight Boheme, inspired by the soap's holiday theme and gourmet ingredients of blue spruce, balsam fir, cocoa butter and shea butter. 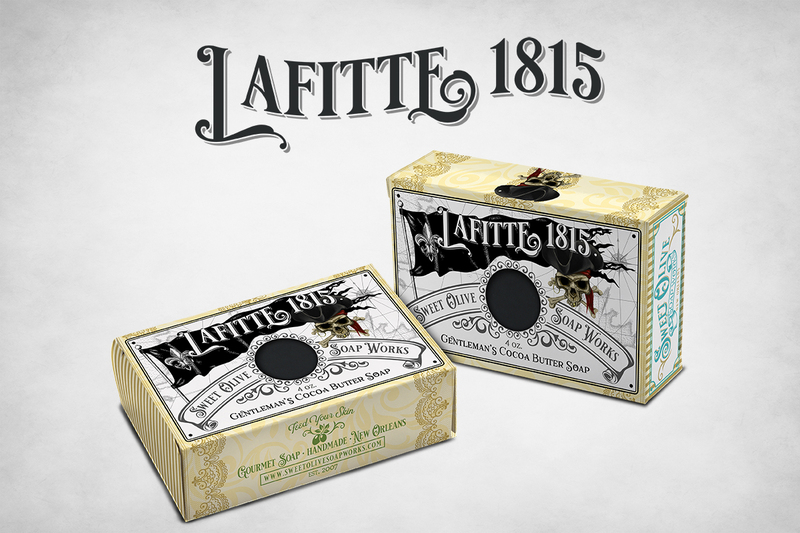 Just for men, Lafitte 1815 Soap is scented with spiced bay rum, the quintessential fragrance of seafaring pirates. 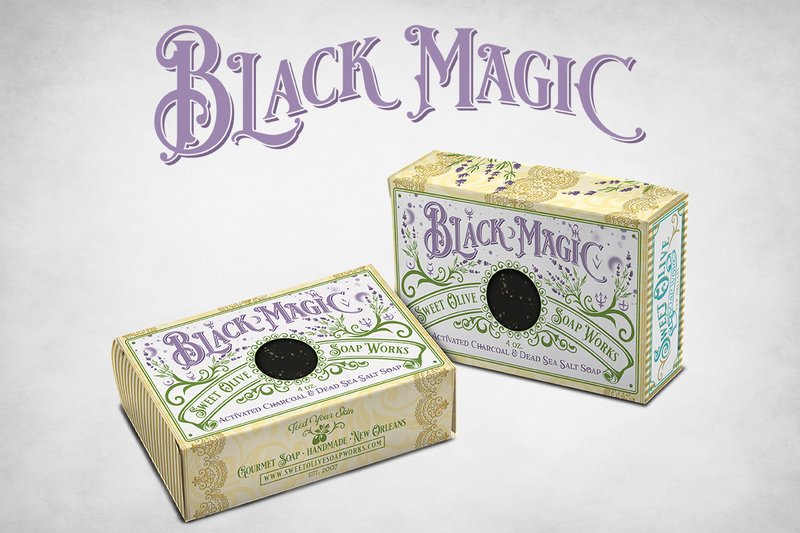 Activated charcoal gives this soap its black hue, which draws toxins from the skin in a rich lather of manly cocoa butter and bubbles. 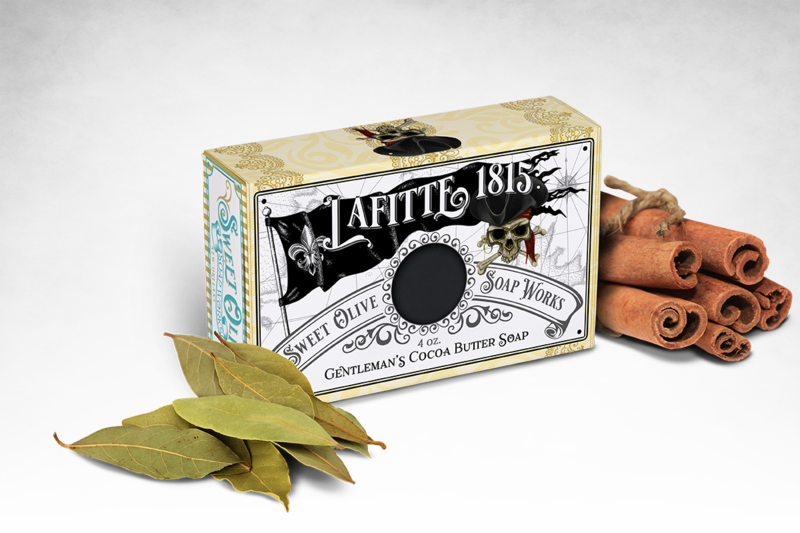 Packaging design by Midnight Boheme, inspired by the soap's gourmet ingredients of charcoal with spiced bay rum and its namesake, the Pirate Jean Lafitte. 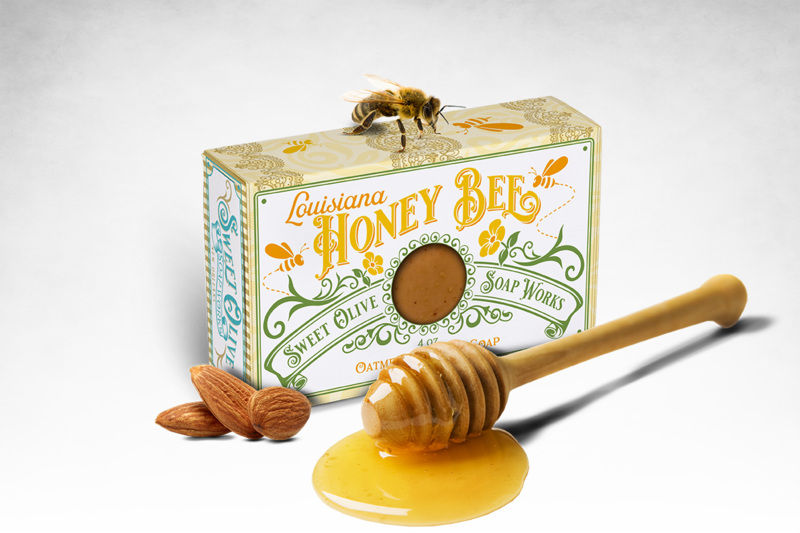 The savory fragrances of honey, almonds and buttercream blended with locally sourced raw honey and beeswax, colloidal oatmeal and a heavy pour of sweet almond oil will have you buzzing in the shower! Packaging design by Midnight Boheme, inspired by the soap's gourmet ingredients of almonds, honey and beeswax. Magnolia is Queen in the Deep South. 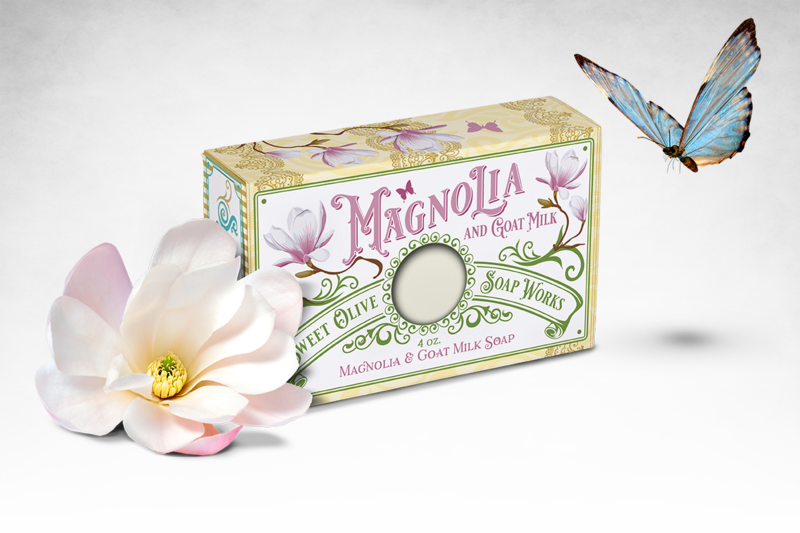 With its glossy evergreen leaves and big, fragrant white blossoms, this southern beauty is a timeless treasure captured in this Magnolia & Goat Milk Soap. 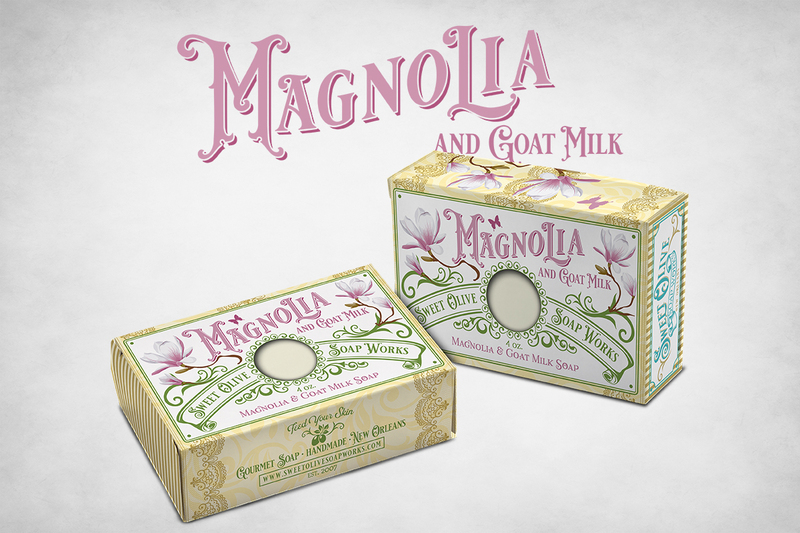 Packaging design by Midnight Boheme, inspired by the soap's gourmet ingredients of magnolia blossoms and goats milk. 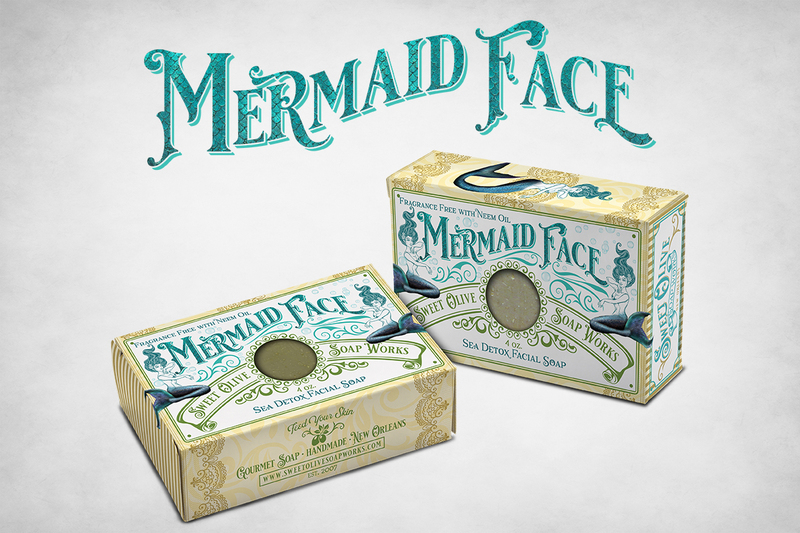 All natural and fragrance-free facial soap that features ingredients harvested from the sea, Mermaid Face can be used on even the most sensitive skins. Mermaids may be mythical, but perfect skin is not. 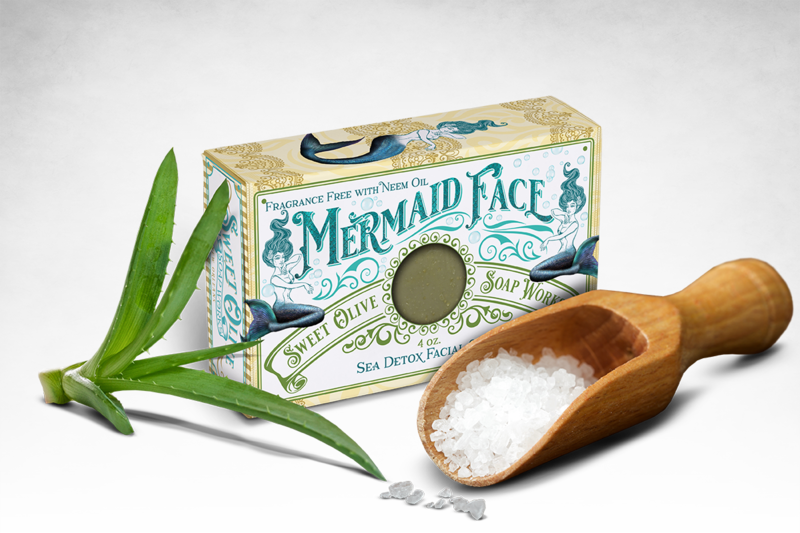 Packaging design by Midnight Boheme, inspired by the soap's gourmet ingredients from the sea and the mythical mermaid. Here in New Orleans, Mondays have always traditionally been laundry day. 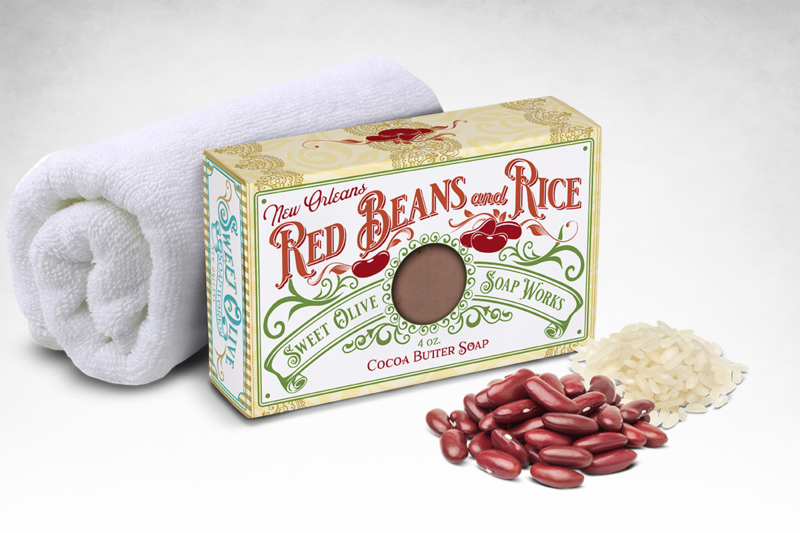 So NOLA ladies would put on a big pot of red beans and rice to slow cook all day while they did their laundry. Hence the reason why a fresh laundry scent and red beans and rice go hand in hand! 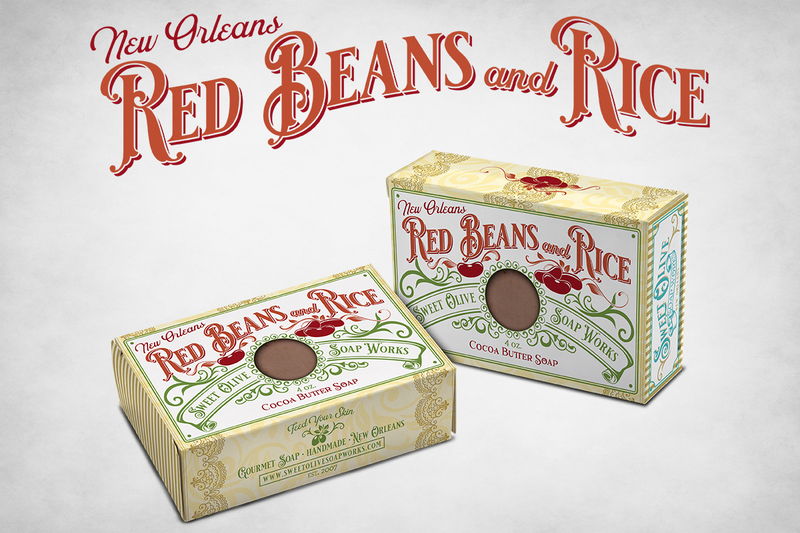 Packaging design by Midnight Boheme, inspired by the soap's gourmet ingredients of red beans and rice slow-cooked on laundry day. Pamper yourself in a sensationally bubbly lather scented with the refreshing combination of satsuma fragrance and peppermint essential oils formulated to provide all skin types with a deep-down clean. 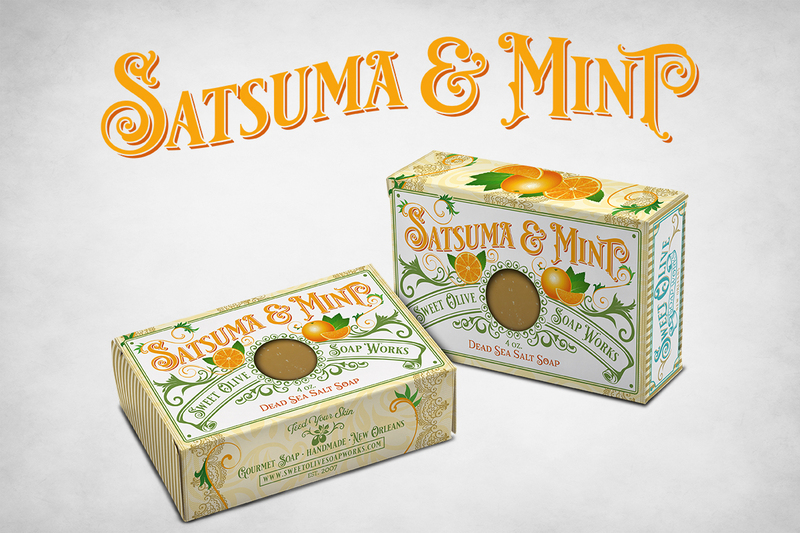 Packaging design by Midnight Boheme, inspired by the soap's gourmet ingredients of ripe satsumas and peppermint. 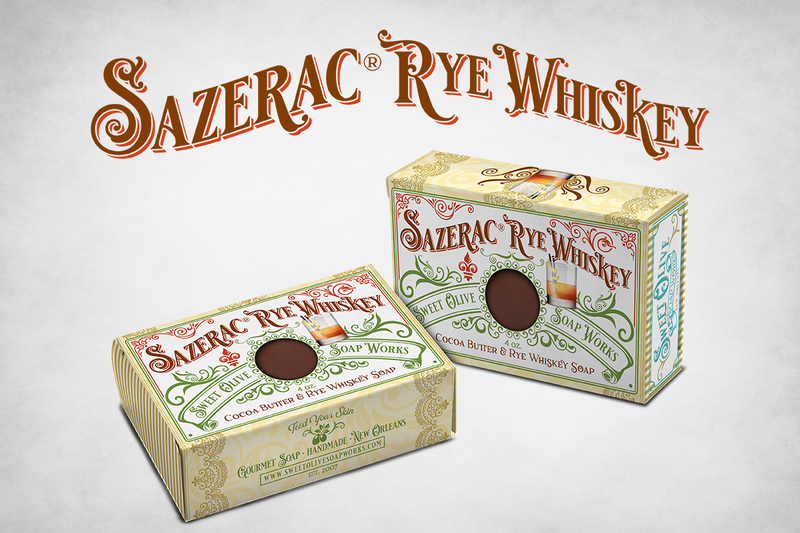 A rich infusion of cocoa butter and Sazerac Rye Whiskey scented with the full-bodied fragrance of Vanilla Bourbon that pays homage to New Orleans’ official cocktail. 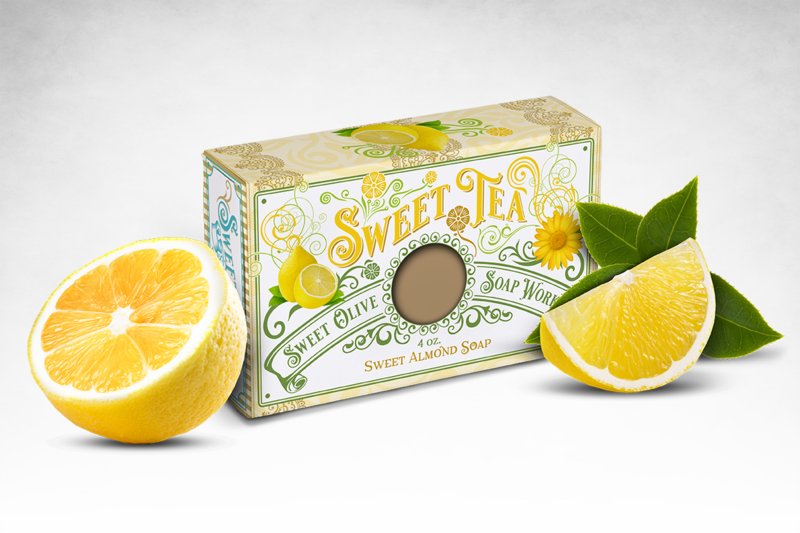 Packaging design by Midnight Boheme, inspired by the soap's gourmet ingredients of lemon, sugar, and vanilla. 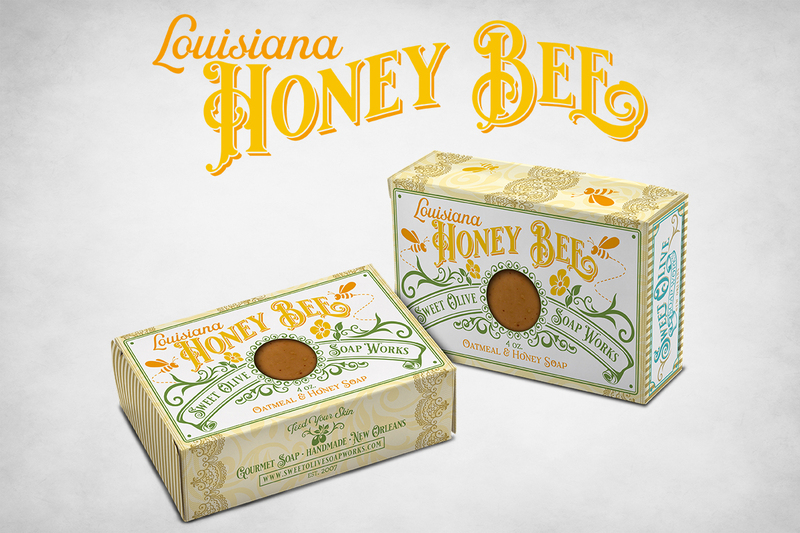 Featuring the charming fragrance of honeysuckles in bloom, each honeycomb bar soap contains a luxurious blend of vegetable oils complimented with a heavy pour of sweet almond oil that promotes remarkably soft and healthy skin. 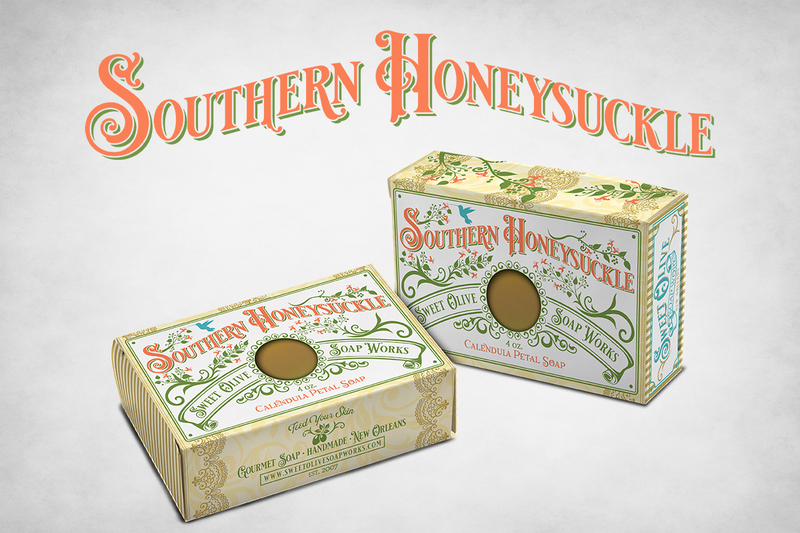 Packaging design by Midnight Boheme, inspired by the soap's gourmet ingredients of honeysuckle and sweet almond. 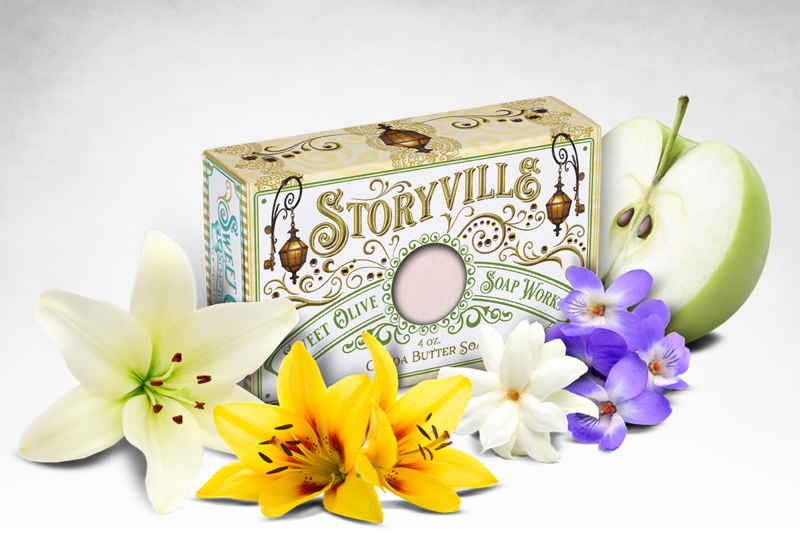 Inspired by New Orleans notorious red-light district, Storyville moisturizing cocoa butter soap is a flirty and feminine fragrance blend of jasmine, lily, lime and violet with hints of green apple. 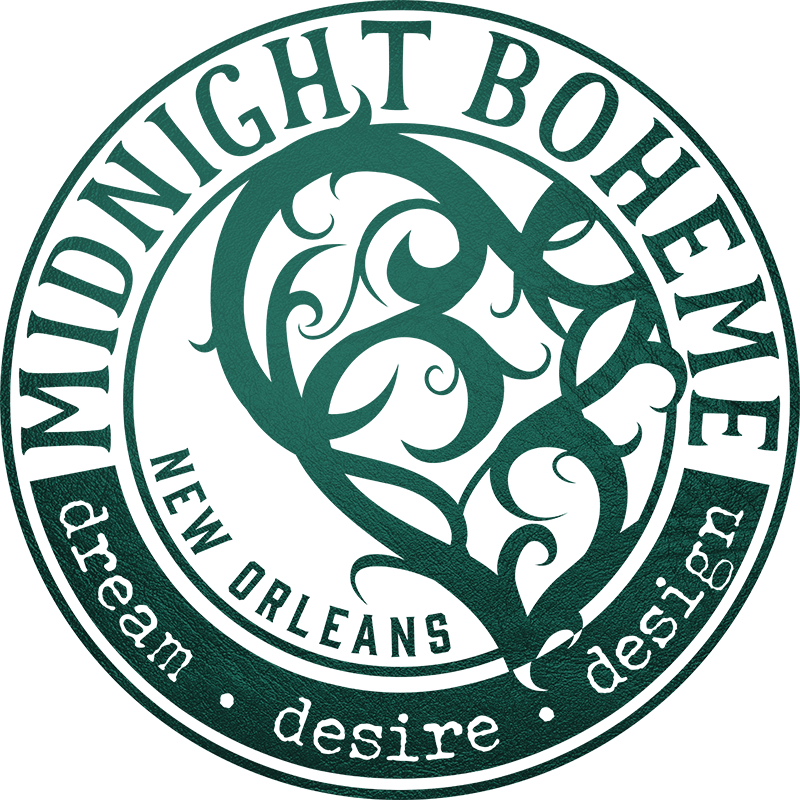 Packaging design by Midnight Boheme, inspired by the soap's namesake of historic Storyville in the gilded age of New Orleans, Louisiana, along with the gourmet ingredients of green apple, violets, lilies, and jasmine. Take your senses to the elegant flower gardens of Louisiana where sweet olive blossoms are prized for their delicate and breathtaking charm. Packaging design by Midnight Boheme, inspired by the soap's gourmet ingredients of sweet olive blossoms, lavender, orange blossom, hyacinth, and gardenia. A sophisticated fragrance blend of black tea, white sugar and zings of lemon that taunts the senses and quenches thirsty skin with a moisturizing lather rich in sweet almond oil. 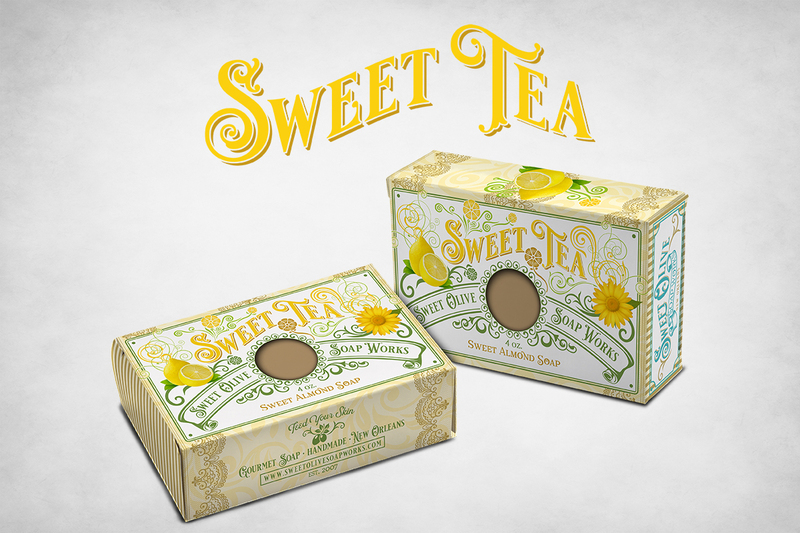 Packaging design by Midnight Boheme, inspired by the soap's gourmet ingredients of tea, sugar, and lemon. A creamy, bubbly and decadent bar of soap complimented with a heavy measure of skin softening sweet almond oil and farm fresh goat milk. Savor the full-bodied fragrance blend of vetiver, petitgrain, and sandalwood. Packaging design by Midnight Boheme, inspired by the soap's gourmet ingredients of vetiver grass, petitgrain and sandalwood. 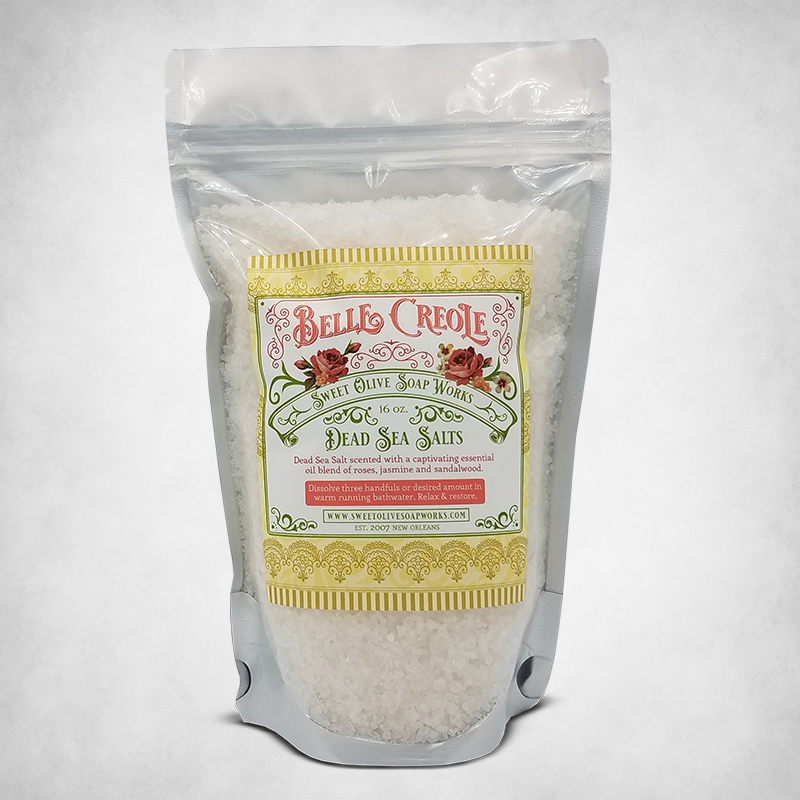 Relax and restore with Belle Creole Dead Sea Salt, scented with a captivating essential oil blend of roses, jasmine and sandalwood. Each bag weighs 16 ounces and contains enough bath salts for four baths. Packaging design by Midnight Boheme, inspired by the sea salt's gourmet ingredient of roses. Relax and restore yourself with the enchanting fragrance blend of French vanilla and lavender essential oils that promotes tranquility and relieves stress by soothing mind, body and spirit. Packaging design by Midnight Boheme, inspired by the sea salt's gourmet ingredients of lavender and French vanilla. Relax and restore yourself in a warm soak of salt harvested from The Dead Sea. 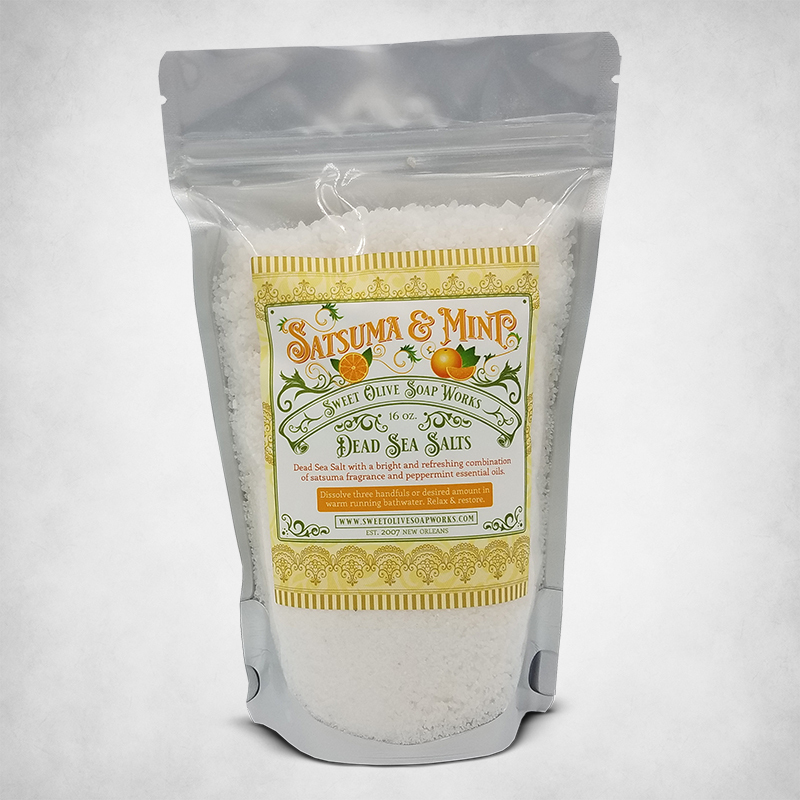 Satsuma & Mint Dead Sea Salt is scented with a bright and refreshing combination of satsuma fragrance and peppermint essential oils. 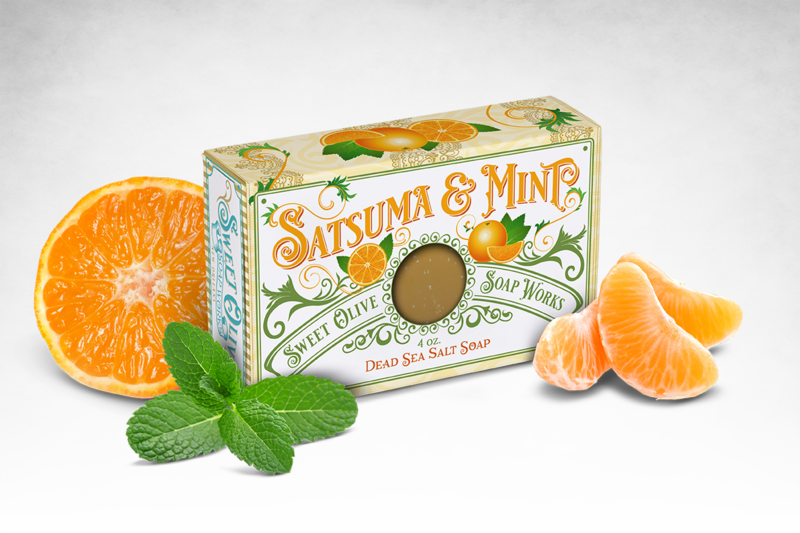 Packaging design by Midnight Boheme, inspired by the sea salt's gourmet ingredients of satsumas and peppermint. 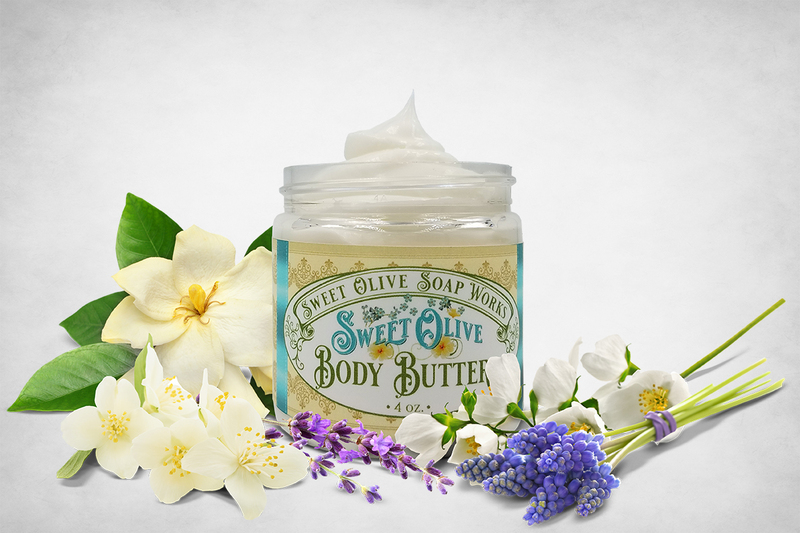 Take your senses to the elegant gardens of Louisiana where Sweet Olive Blossoms are prized for their delicate charm. 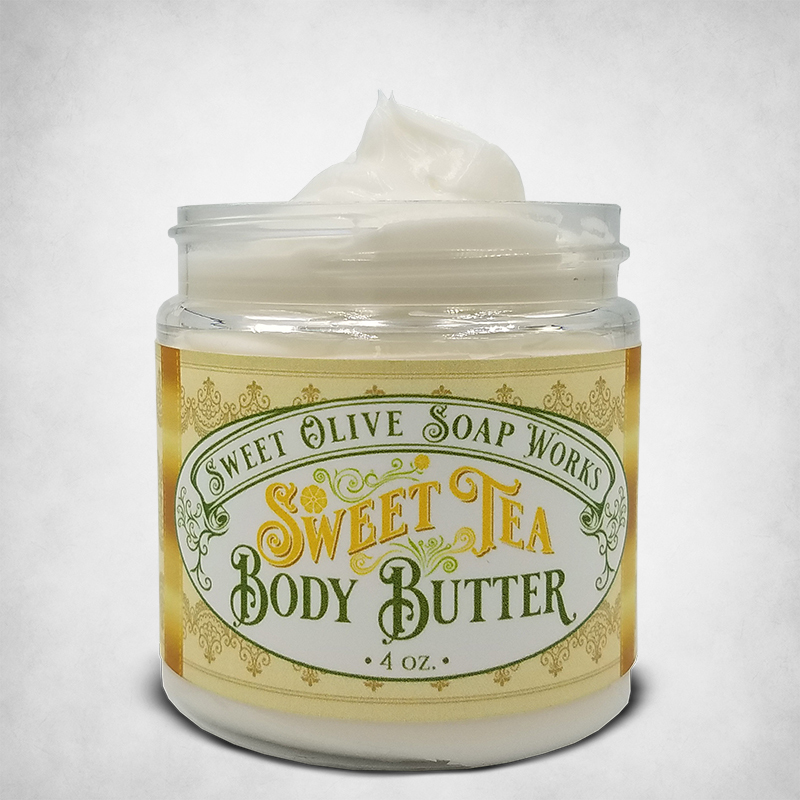 Thick and creamy, a small amount provides your skin with moisture with a rich blend of luxurious oils and butters that naturally promote softer, healthier skin. Packaging design by Midnight Boheme, inspired by the body butter's gourmet ingredients of sweet olive blossoms, lavender, orange blossom, hyacinth, and gardenia. 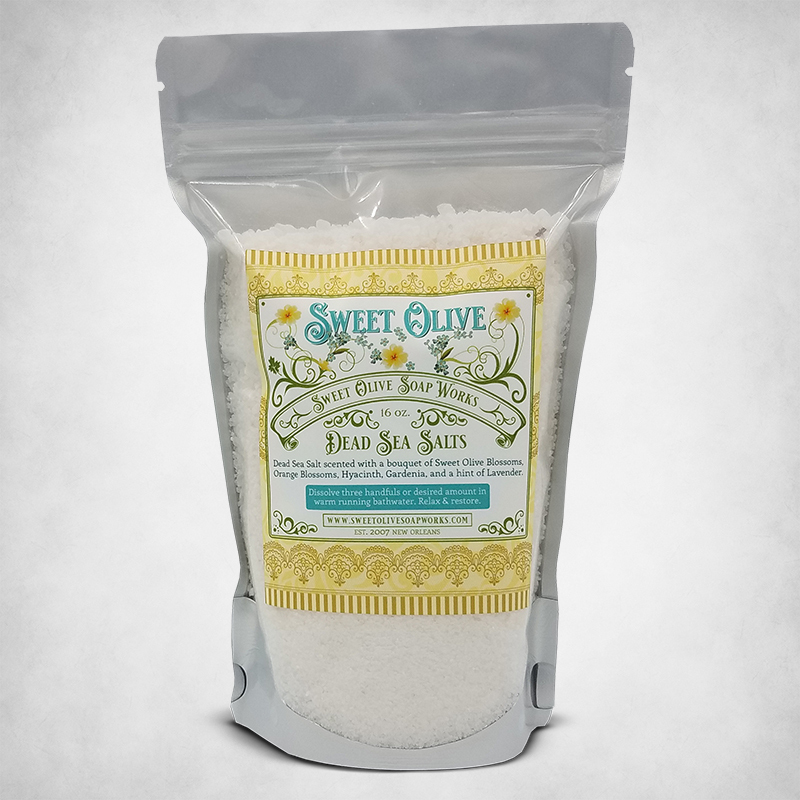 Harvested from The Dead Sea, Sweet Olive Dead Sea Salt is scented with a bouquet of sweet olive blossoms, orange blossoms, hyacinth, gardenia, and a hint of lavender. Packaging design by Midnight Boheme, inspired by the sea salt's gourmet ingredients of sweet olive blossoms, lavender, orange blossom, hyacinth, and gardenia. Sophisticated and playful, Sweet Tea is a mouthwatering blend that combines the smoky fragrance of black tea leaves with sassy notes of Sicilian lemon, Southern orange and white sugar. Packaging design by Midnight Boheme, inspired by the body butter's gourmet ingredients of tea, sugar, and lemon. Timeless and refined, Vetiver is an exquisite blend of vetiver, pettigrain and sandalwood fragrances that celebrate the French Creole heritage of Louisiana. 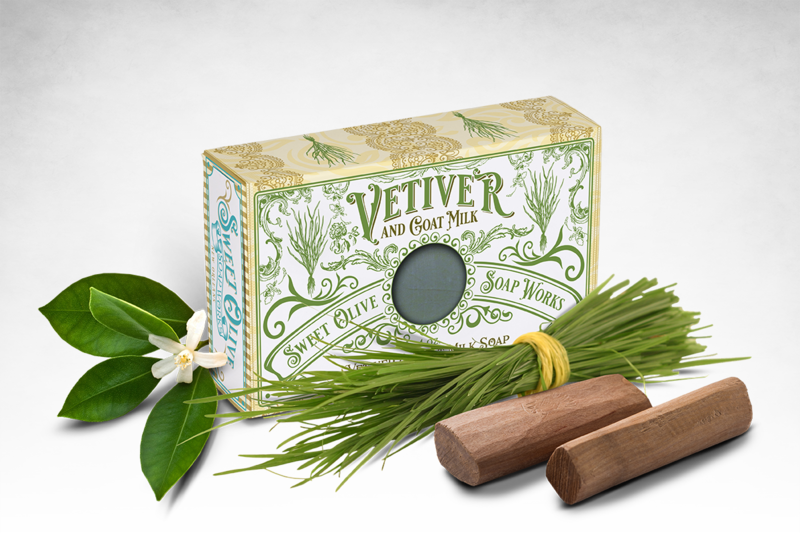 Vetiver is a wonderful gift for friends obsessed with Louisiana history! Packaging design by Midnight Boheme, inspired by the body butter's gourmet ingredients of vetiver grass, petitgrain and sandalwood. 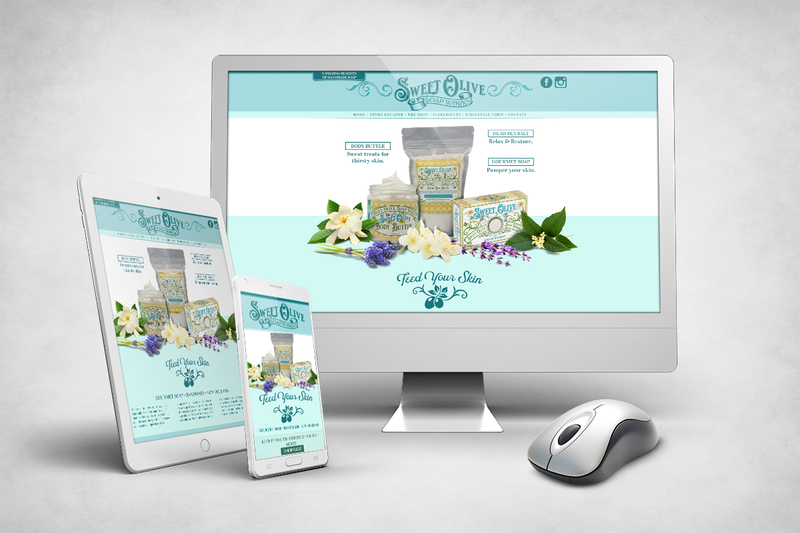 Sweet Olive Soap Works has offered online shopping for several years and when the company rebranded with Midnight Boheme, the designer carried the new style and brand identity to the fresh web design. 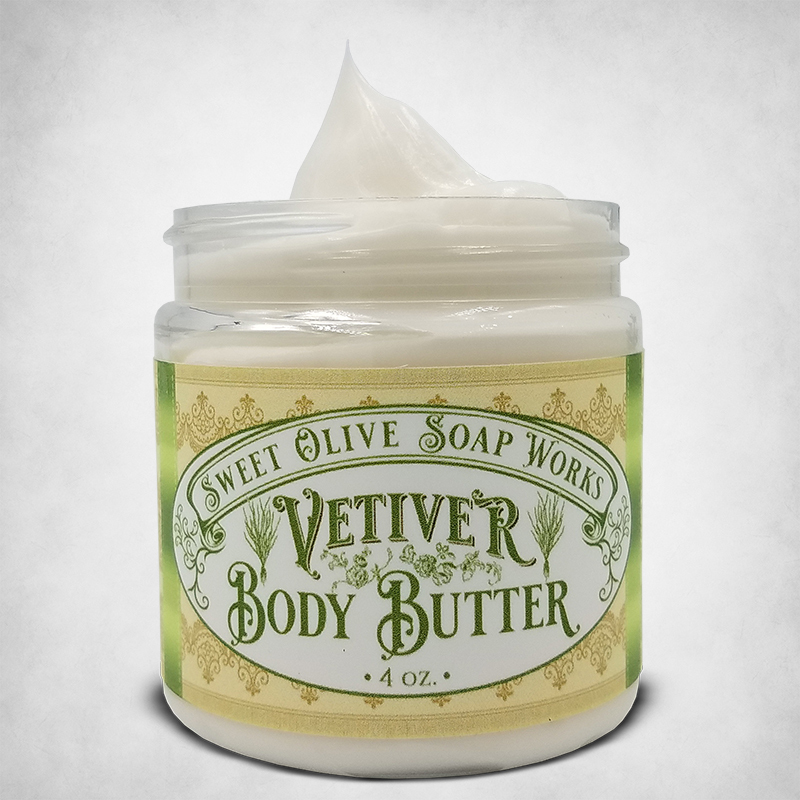 The online store features all the Sweet Olive products available for purchase and the website lists all the stockists of physical storefronts to also purchase Sweet Olive products in Louisiana, Mississippi, Texas, Arkansas, and Ohio.